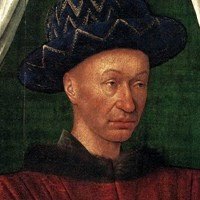 of France by Jean Fouquet. Name: "Portrait of Charles VII of France"
Jean Fouquet, one of the greatest Old Masters in 15th century France and creator of the celebrated Melun Diptych (c.1452), painted this half-length, life-size portrait of King Charles VII (1403-61; reigned 1422-61) either just after the truce of Tours (1444), or following the French victory at Formigny (1450). The king is painted almost face-on, as if through a window edged with curtains. His hands are clasped, and rest on what appears to be a prie-dieu. He is looking out of the portrait to the right of the viewer, whom he is ignoring. He is simply dressed, although the fabric of his robe appears to be elegant and warm. No royal emblems or insignia are visible on his clothes or surroundings. In its realism, fine detail, colour and geometrical composition, the work is considered to be one of the greatest portrait paintings of the French school. Fouquet was one of France's greatest exponents of minature painting - notably of International Gothic illuminations - as well as portraiture. Both these disciplines were dominated by Flemish painters such as Jacquemart de Hesdin (c.1355-1414), Jan van Eyck (1390-1441) and Petrus Christus (1420-73). Not surprisingly, therefore, Fouquet was strongly influenced by Flemish painting, especially the Bruges school. This is evidenced by his precise rendering of the various types of cloth (Charles' robe, and the patterned fabric of both his hat and the prie-dieu), and his realistic depiction of Charles' facial features. However, we know that Fouquet was also influenced by the art of the Florentine Renaissance, notably the work of Andrea del Castagno (c.1420-57) which he encountered during his visit to Italy about 1448, suggesting that this portrait was completed before his trip. (Note: Fouquet was particularly inspired by the sculptural qualities of Andrea del Castagno's paintings, which the latter had picked up from studying figurative sculptures by Donatello.) Despite the inspiration he drew from his introduction to Renaissance art, Fouquet remained more attached to Gothic art, a preference illustrated by his lack of interest in creating any depth in the portrait. Looking at other features: the sharply juxtaposed colours and the rigid composition of the geometrical forms give the king a cool presence. The pointedly sedate light effects bring out the king's face, highlight elements of his head covering, and emphasize the gathered curtains, which resemble a window around the painting. Fouquet worked mostly for the French royal courts: he was official painter to Charles VII and Louis XI. A contemporary of the Provencal artist Enguerrand Quarton (c.1410-1466), Fouquet was famous for about a century after his death, then forgotten about until his rediscovery during the 19th century. When the above portrait was bought by the Louvre Museum in 1838, its author was assumed to be an anonymous Greek artist. However, as soon as the sitter was identified, experts concluded that it was the work of Jean Fouquet, official painter to Charles VII, and that it must be the portrait which Charles presented to the Sainte Chapelle in Bourges. The portrait remained in the chapel until 1757.  Belleville Breviary (1323-26) Bibliotheque Nationale, Paris.  Hours of Jeanne d'Evreux (1324-28) The Cloisters, Metropolitan Museum.  Avignon Pieta (1454-6) Louvre, Paris.  Man in a Red Turban (1433) National Gallery, London.  Arnolfini Portrait (1434) National Gallery, London.  Portrait of a Young Girl (1470) Gemaldegalerie, Staatliche Museen, Berlin.  For the interpretation of other 15th century portraits, see: Homepage.